Did you know that there are certain tools that you should keep in your vehicle at all times just in case of an emergency? 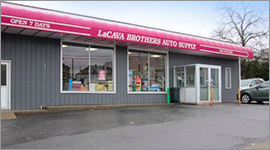 LaCava Brothers Auto Supply & Service provides top quality tools and auto parts in Fall River, MA and also offers an array of fluids, cleaning chemicals, and trusted services to help keep your vehicle in good running condition. Before you take a road trip or start another week of your daily commute, you should evaluate the safety options that you have inside your vehicle and determine whether it’s time to upgrade your tool situation. It is important to have a box that you can keep all of your tools in to prevent them from becoming a hazard in an accident. If your vehicle has a trunk, keep them inside the toolbox inside of your trunk. If you have an SUV, make sure to find a way to secure your toolbox in the back, so it won’t be able to come loose in an accident. You can find tool boxes and tool kits at LaCava Brothers Auto Parts in Fall River, MA, as well as all of the car parts and accessories you need to keep your vehicle running in tip-top shape. Start by getting a good quality flashlight. Stay away from the cheap options that you will find at the big box stores and look for a sturdy option that takes D-cell batteries or LED models with lithium batteries. Just make sure that you check the batteries often and keep a spare set of batteries and an extra bulb in your toolbox. A pre-packaged emergency tool kit can also be helpful in addition to any extra tools that you keep in your toolbox. LaCava Brothers Auto Supply & Services in Fall River, MA has a variety of tool kits that you can browse that will help you in a pinch. A first aid kit is also important and should include the basic items required for a minor or major injury, such as band-aids, disinfectant, sanitizers, gauze, pain relievers, and antibiotic ointment. You can usually pick up a basic kit for under $25. 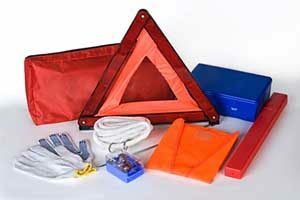 Flares, safety triangles, and a fire extinguisher should round out the safety basics portion of your emergency toolbox. Make sure to check them often, make sure that you are storing them safely and properly, and that you know how to use them effectively in case of an emergency. The next step is to gather all of the must-have tools to take care of your automotive parts and service in Fall River. LaCava Brothers has a broad range of tools that you can use to fill out the rest of your toolbox. Make sure you have a good pair of pliers, multi-head screwdrivers in a variety of sizes, and a good adjustable wrench. It wouldn’t hurt to add a pair of vise grips and a set of wire cutters, as well as a pocket knife and a small ball-peen hammer. Electrical tape, electrical wire, spare fuses, and a roll of mechanic’s wire can also help you if you get in a pinch. The best way to keep it all together is to use a tool bag that can be wrapped up and stowed in your emergency toolbox. If you are in need of automotive parts and services in Fall River, MA or if you simply need to purchase tools, car parts, and accessories for your toolbox, make sure to stop by LaCava Brothers. For over 70 years, we have served the Greater Fall River area, providing top quality tools, parts, fluids, accessories, and services to customers and professional clients throughout the Southeastern Massachusetts region. Give us a call at 508-676-1951 or stop by our location on Bedford Street in Fall River, MA.